Pups Love to Play in the Surf, Too! Are dogs allowed off leash on public beaches? Are they allowed off leash on your own private beach if you're renting a beach front home?" Great questions, Audrey. Thanks for asking! I'm sure lots of vacation-loving dogs and "their people" are curious about Cape Cod's pet friendly beach rules, too. 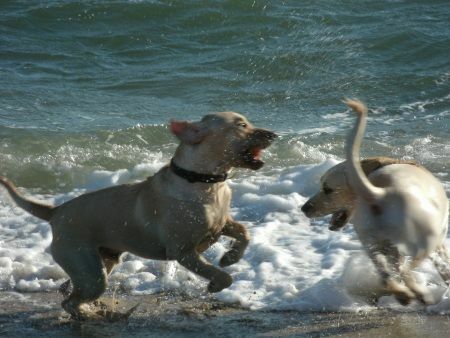 During the summer months, the rule is "No Dogs on the Beach" in most Cape Cod towns. In the off season, the rules are relaxed. To leash or not to leash? Unless I've noted otherwise below, assume that leashing is required at all times. It's a Beautiful Day for a Run by the Bay! Dogs are not allowed at any time, in any beach/recreation area, from May 15 to September 15. Dogs are not allowed on the beach from May 1 to October 15. Dogs are not allowed on town beaches between May 1 and October 1. Dogs are not allowed in beach areas from May 1 to September 15. No pets are permitted on the beaches, in the parking areas, or in unattended vehicles in the parking areas at any time from Memorial Day through Labor Day. No pets are allowed on the beaches, in the parking areas, or in vehicles in the parking areas at any time from June 15th through Labor Day. Dogs are not allowed on public beaches between May 1st and October 1st. No pets are permitted on any beaches (including sand, dune, water and parking lots) from Memorial Day to Labor Day. No dogs allowed on town-owned public beaches at any time. No pets may be on the beaches, in the parking areas, or in vehicles in the parking areas at any time from the Friday before Memorial Day through Columbus Day. From Memorial Day through November 1, dogs may be off-leash on town beaches, if under voice and sight control, between the hours of 6 am and 9 am and the hours of 6 pm and 9 pm. From November 2 through the day before Memorial Day, dogs may be off-leash on town beaches, if under voice and sight control, between the hours of 6 am and 9pm. All dogs must be restrained on town beaches at all other times. From May 15 to September 15, dogs are prohibited on any public beach or dune. All animals are prohibited between the hours of 9 a.m. and 6 p.m. from the third Saturday in June through Labor Day. Dogs must be leashed at all times on town beaches and landings between May 15th and October 15th. Dogs are not allowed on the lifeguarded portions of Newcomb Hollow, Cahoon Hollow, White Crest and Maguire Landing at LeCount Hollow between the hours of 9am and 5pm during the summer season, except to walk from the parking lot to a point beyond the end of the guarded beach. 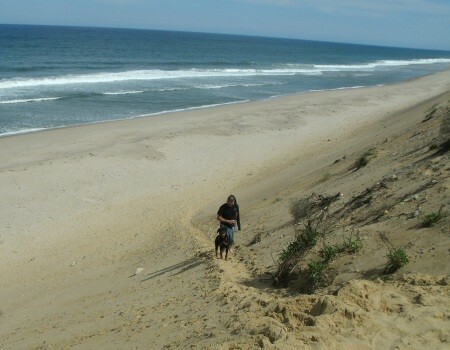 Dogs are never allowed on Burton Baker Beach, Indian Neck and Nauset Road Beach, Mayo Beach and Powers Landing. Dogs are not allowed in the following freshwater ponds or on the beaches of these ponds: Gull Pond, Long Pond, Great Pond, Duck Pond, Higgins Pond, the Sluiceway, Spectacle Pond, or Dyer Pond from May 15th through October 15th. Dogs are not allowed on public beaches at any time. 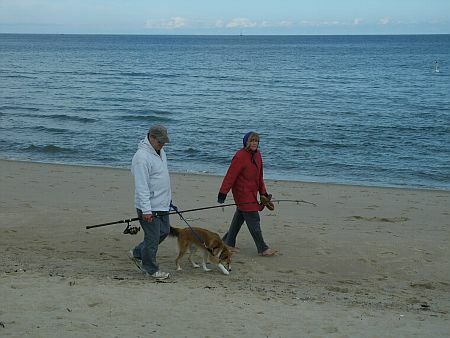 Generally speaking, leashed dogs are allowed on Cape Cod National Seashore beaches year round. Also, during shorebird nesting periods, pets are prohibited from posted areas. Passing through the posted areas is also prohibited. 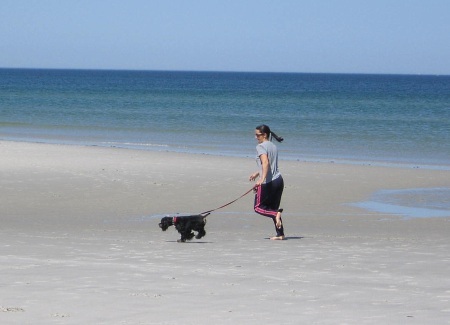 At South Cape Beach State Park in Mashpee, dogs are allowed at the beach from mid-September through April. Are Private Beaches Pet Friendly? On private beaches, it's up to the property owner to decide if pets are allowed on the beach. Note to Renters: Some waterfront, pet-friendly vacation rentals are part of a private beach association - and many beach associations have strict rules about pets on the beach. Please, do yourself a huge favor. Check with the property owner or rental agent before you sign a vacation rental agreement to be sure your furry friend can enjoy the beach with you!